Re-enacting groups, Ren. Faires and other organizations often have specialized regalia to indicate various things. I am often asked to create such objects to order, and even keep a few of the more common items in stock. 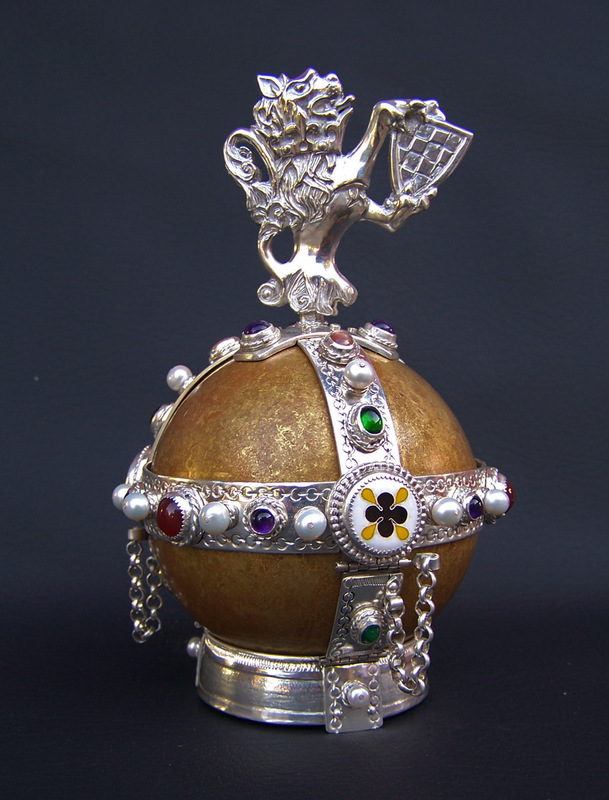 For long years the Royal Orb of the Kingdom of An Tir was simply a brass knob, about the size of a billiard ball. It was not very interesting, and was seldom used or seen. Not long ago I was asked to make it look, well, royal. So I set it with silver straps set all about with pearls and gemstones, and a lion on top. The number and position of the straps and other elements all have allegorical meaning that I have not the time here to describe. The stones are emeralds, carnelian, amethyst, chrome diopside, and Oregon sun-stones. All were donated for the project, and many had belonged to people from the Kingdom who have recently passed on. I also wanted to include the work of other artists in his project. The enamels were made by L.A. Fine, and the coin set under the base was made by the late G.P. Franck-Weiby. Not long ago I began teaching myself to do a little intaglio work, and found that before I had even gotten started, I had two custom orders. 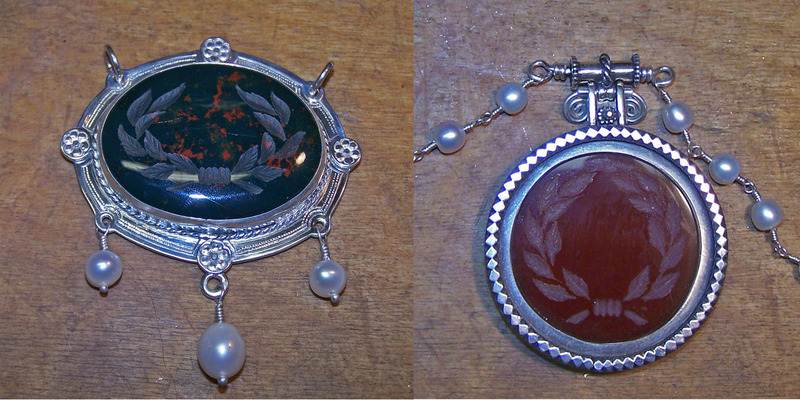 The first is a Renaissance style medallion, cut in blood-stone, and set in silver with pendant pearls. The other is Late Roman style, worked in carnelian, and hung from a chain of pearls. Sterling silver, with various gemstones. Though I make all manner of badges and medallions to order, I try to keep some of the most popular designs in stock. 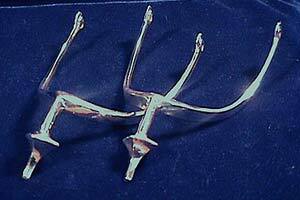 These cast silver pelicans and laurels, can be purchased plain, or fitted with pearls and gemstones. In this simple wreath the leaves are engraved and soldered to a structure of forged silver wire. I make these to order. These graceful 12th century prick spurs are available in either silver or bronze, and with the option of custom mounts and fittings. This massive chain was a custom order for a woman in California. The medallions with the roses are thick, and 50mm across, about the size of a silver dollar. 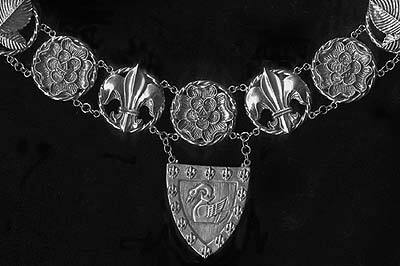 This collar is made of twenty linked silver crossed crosslets, each set with a square garnet, and the links betwen them are carved to the shape of barbed quatrefoils. 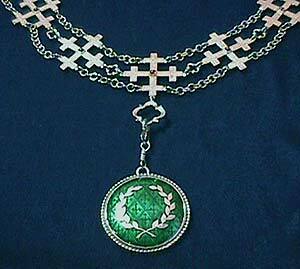 The pendant is a green enamel with the crossed crosslet pattern in the diapering. It is set with a garnet on the reverse. The challenge with this project was that the customer had the work of six other artisans that he wanted to have incorporated into the design, and wanted the whole gold plated. The Body of the coronet is plated sterling silver, with a diaper pattern, and tooled and cast additions. The laurel leaves are carved chrome diopside, and the pelican’s drop of blood is garnet. The plaques are alternating gold inlay on blued steel, and cloisone enamel. I based the pearl brackets on the design of a 13th c. gold Florin. 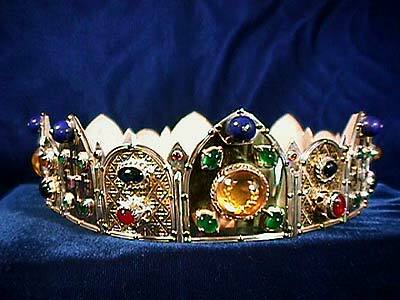 Making this coronet occupied my time for some months. 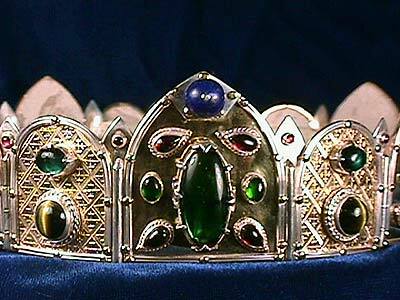 In this view of the front you can see some of the many beautiful stones, including the four large emeralds around the central intaglio, and flanked by rubies and sapphires. The large tourmaline at center is set in prongs carved to the shape of fleur de lis. The diaper pattern visible on the adjacent panels gives sparkle to the work. These represent the range of crown and coronet work I get asked to do. On the upper left is one of a pair of Arts and Crafts style coronets in the form of wreaths of strawberry vines, with little carved garnet berries. Below that is the massive Spanish Renaissance piece, complete with lions, castles and pirate ships. 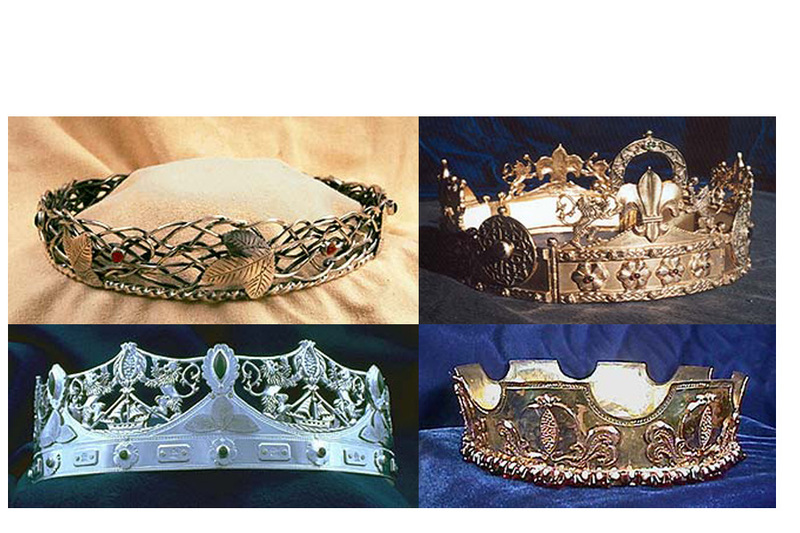 The Bronze Renn-faire crown at upper right, is hinged and has the features they requested from a number of periods. The coronet at bottom right, is made of yellow and red brass, with pearls, and garnets cut to look like pomegranate seeds.